On the 11th (Tue), explore the activities along Lagoa do Fogo, then take in the spiritual surroundings of Nossa Senhora da Paz, then take in the dramatic natural features at Caldeira das Sete Cidades, and finally get great views at Boca do Inferno Viewpoint. Get ready for a full day of sightseeing on the next day: get great views at Miradouro de Santa Iria, explore the striking landscape at Poca Da Dona Beija, take in nature's colorful creations at Parque Terra Nostra, then get great views at Pico do Ferro Viewpoint, and finally look for all kinds of wild species at Environmental Interpretation Centre of Caldeira Velha. 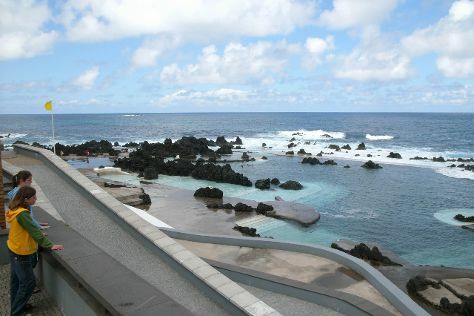 For other places to visit, photos, reviews, and other tourist information, use the Ponta Delgada online sightseeing planner . Belem, Brazil to Ponta Delgada is an approximately 20-hour flight. The time zone difference moving from Brasilia Time (BRT) to Azores Time (AZOT) is 2 hours. In June, Ponta Delgada is a bit cooler than Belem - with highs of 24°C and lows of 19°C. Wrap up your sightseeing on the 12th (Wed) to allow time to travel to Funchal. On the 13th (Thu), identify plant and animal life at Ponta de Sao Lourenco, step off the mainland to explore Ilheus da Ribeira da Janela, and then explore the activities along Porto Moniz Natural Swimming Pools. Get ready for a full day of sightseeing on the 14th (Fri): learn about winemaking at Blandy's Wine Lodge, tour the pleasant surroundings at Santa Catarina Park, and then see majestic marine mammals with a dolphin and whale watching tour. For maps, reviews, where to stay, and tourist information, you can read our Funchal vacation planner. Traveling by flight from Ponta Delgada to Funchal takes 5 hours. You'll lose 1 hour traveling from Ponta Delgada to Funchal due to the time zone difference. In June in Funchal, expect temperatures between 28°C during the day and 21°C at night. Wrap up your sightseeing on the 14th (Fri) to allow time to travel to Porto. Step off the beaten path and head to Wine Tours & Tastings and Centro Historico de Guimaraes. Get out of town with these interesting Porto side-trips: Bom Jesus do Monte (in Braga) and Santuario de Santa Luzia (in Viana do Castelo). There's much more to do: take in the views from Ponte de Dom Luis I, take a stroll around Palacio da Bolsa, go for a stroll along the water at Cais da Ribeira, and contemplate in the serene atmosphere at Porto Cathedral (Se Catedral). For other places to visit, photos, maps, and tourist information, read our Porto tour planner. Traveling by flight from Funchal to Porto takes 4.5 hours. Traveling from Funchal in June, Porto is slightly colder at night with lows of 16°C. Cap off your sightseeing on the 17th (Mon) early enough to travel to Lagos. 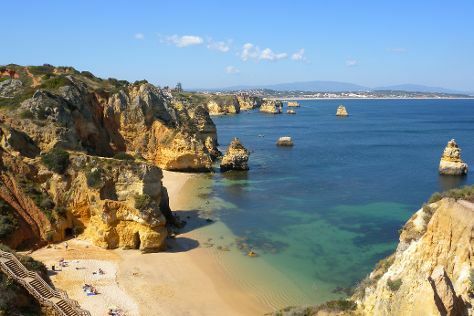 Explore hidden gems such as Ponta da Piedade and Praia Da Rocha. Change things up with these side-trips from Lagos: Cape Saint Vincent (in Sagres) and Falesia Beach (in Olhos de Agua). There's still lots to do: take in the waterfront activity at Marina de Vilamoura, visit a coastal fixture at Lagos Farol da Ponta da Piedade, take in the waterfront at Alvor Boardwalk, and get up close to creatures of the deep with a dolphin and whale watching tour. To see ratings, other places to visit, reviews, and more tourist information, read Lagos trip builder . You can do a combination of flight and bus from Porto to Lagos in 5 hours. Alternatively, you can drive; or do a combination of train, flight, and bus. In June, Lagos is somewhat warmer than Porto - with highs of 32°C and lows of 21°C. Finish your sightseeing early on the 20th (Thu) so you can drive to Evora. Start off your visit on the 21st (Fri): gain insight at Garcia de Resende Theater (Evora), make a trip to Lookout - Cordovil House Gallery (Evora), take in the spiritual surroundings of Cathedral of Evora (Se Catedral de Evora), then make a trip to Centro Historico de Evora, then do a tasting at Adega Ervideira, and finally make a trip to Capela dos Ossos. 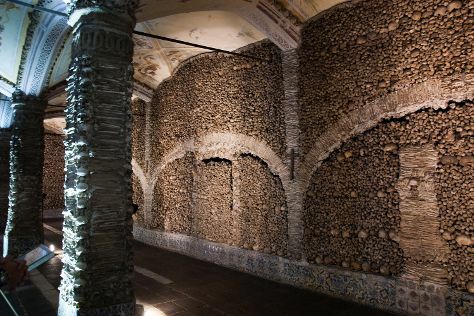 Get ready for a full day of sightseeing on the 22nd (Sat): contemplate in the serene atmosphere at Templo Romano de Evora (Templo de Diana), see the interesting displays at Museu de Evora, then awaken your taste buds at some of the top wineries in the area, then explore the ancient world of Almendres Cromlech, and finally pause for some serene contemplation at Igreja de Sao Francisco. To see reviews, more things to do, where to stay, and more tourist information, you can read our Evora road trip planning tool . Getting from Lagos to Evora by car takes about 3 hours. Other options: take a bus; or do a combination of bus, flight, and train. While traveling from Lagos, expect a bit warmer days and little chillier nights in Evora, ranging from highs of 36°C to lows of 17°C. Cap off your sightseeing on the 22nd (Sat) early enough to go by car to Lisbon. Go for a jaunt from Lisbon to Sintra to see Quinta da Regaleira about 36 minutes away. The adventure continues: admire nature's wide array of creatures at Lisbon Oceanarium, don't miss a visit to Santa Justa Lift, wander the streets of Parque das Nacoes, and take in the views from Ponte 25 de Abril. To find other places to visit, ratings, more things to do, and tourist information, you can read our Lisbon online route builder . Traveling by car from Evora to Lisbon takes 1.5 hours. Alternatively, you can take a train; or take a bus. While traveling from Evora, expect a bit cooler days and about the same nights in Lisbon, ranging from highs of 32°C to lows of 18°C. Wrap up your sightseeing on the 25th (Tue) to allow time to travel back home.